So this week, I received an email that the 2014 Edublog Awards voting polls were now open. I didn’t think anything of it, until I noticed one of my student’s name, and the name of her blog, on the list. At first, I thought, “Hmmm, the name ‘Bella’s Blog’ must be pretty common. What a coincidence!” After all, there were THOUSANDS of entries in DOZENS of categories, from schools AROUND THE WORLD, that poured in to the Edublog headquarters in last month. 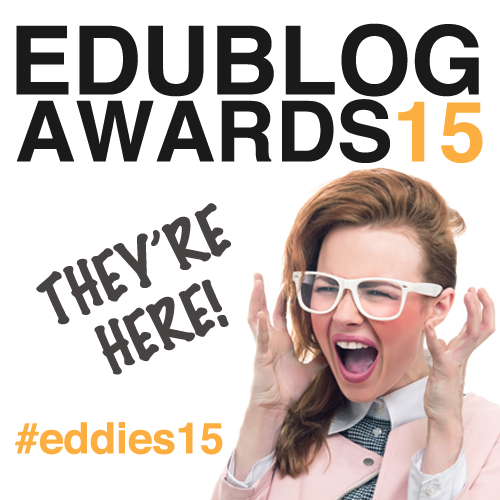 SEVERAL Edublogs staff members sifted through them…really, what were the chances? But then I clicked on the link and got very excited. Our very own Bella H. from Room 414 was one of forty-four finalists for Best Student Blog 2014! I think I can speak for her classmates who are elated to have her nominated, and can’t wait to see the results in mid December. Now, we need YOUR VOTE! —–> If you are a student under 13, then it’s easy…visit the Student Edublog Challenge Voting page and vote from the poll list. —–> If you’re an adult, vote using the link above OR vote using the List.ly poll below. Results will show in real-time. The List.ly widget can also be embedded or shared so you can spread the word. 1) You will need to create a quick, free List.ly account. 2) Search the choice by keyword “Bella”. 3) Then click the “like” thumb to vote . You can vote once a day, every day until December 15th. Thanks so much for considering her. And while you’re at it, please visit any of her 28 AMAZING classmates from their links on this page. They’d love to hear your comments!